Disney just recently up the ante in the Cruise Ship wars. With their new mega ship, The Dream, Disney thinks they can battle the major cruise lines like Royal Caribbean and Carnival. Everyone has associated Disney cruises with kids and Mickey Mouse everywhere. Disney decided that its next round of ships should cater to everyone, and they’ve done just that. But not so fast Disney… Royal Caribbean is on their toes too. The king of cruises has released two new ships listed as the “Oasis” class. The huge Oasis of the Seas is truly the Titanic of its era. How do these two mega ships compare? 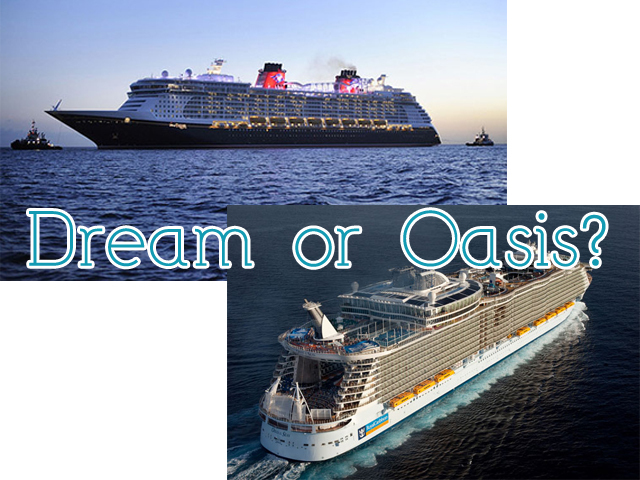 I’ll be comparing the two newest and best cruise ships in the world. In the size competition, the Oasis of the Seas wins by a fairly close margin. At double occupancy, 5400 passengers can ride comfortably in the Oasis, while the ship can actually hold 6,296 maximum. 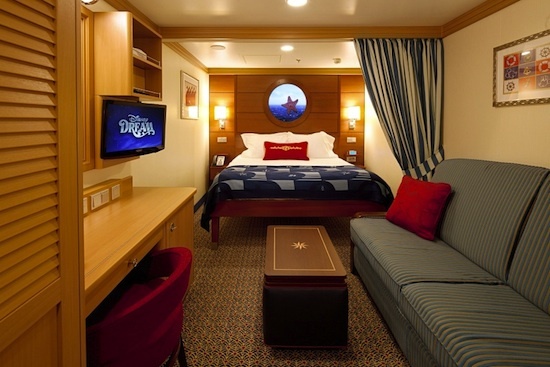 The Disney Dream can hold approximately 4,000 passengers. The Oasis is 1,187 ft long with 16 passenger decks, while the Dream spans 1,115 ft with 14 passenger decks. Both ships are gigantic and dwarf their older sister ships. Staterooms on both ships are comparable in size. However, Disney has done its best to make sure most rooms have some kind of ocean view. Even if you’re stuck on an inside room in the Dream, you’ll still have a view outside. Thanks to Disney’s “Virtual Portholes,” you’ll see a realtime video of what’s going on outside. However, Disney has thrown in something extra that those of us that aren’t young may not enjoy. Disney characters will occasionally drop by and see what’s going on. Disney may have gone overboard. I really don’t want a Finding Nemo character staring at me when I wake up. Good thing the Virtual Porthole can be turned off with an on/off switch. The Oasis of the Seas on the other hand has the unique feature of “neighborhoods” as Royal Caribbean calls them. Some of these neighborhoods don’t actually house any accommodations, but some do. The neighborhoods that have accommodations include “Central Park,” “Boardwalk” and “Royal Promenade.” It’s a very nice little, theme park-style touch that Royal Caribbean put into its ship. It’s very tough to compare both ships when it comes to entertainment. Both have huge Broadway-style theaters that put on nightly productions. However, Disney wins with their fabulous live entertainment. You can catch a musical each night on the Dream that you might pay $50 or more to see in your local theater. The Oasis of the Seas has some theater productions, but none can compare to the caliber Disney pumps out every night. No one wants to be cooped up inside though. Everyone wants to be up on the top deck catching some rays and swimming. Each ship has their own advantages/disadvantages when it comes to soaking your swimsuit. On the Dream, you can slide down one of two slides. The main slide is a “Master Blaster” slide called Aquaduck. This somewhat-thrilling slide takes you through a clear tube over the ocean over two hundred feet in the air and then winds its way back and forth over the top deck. It’s the only slide of its kind and it’s well worth the wait. The Oasis features larger pools, but lacks water slides. There’s a zero depth entry pool like you’ll find at water park’s wave pools and a sports pool for swimming laps. The Oasis also features two FlowRiders that create a giant wave you can bodyboard or surf on. Both ships offer an adult 18 and over pool so that you can get away from the screaming and splashing kids, and, of course, plenty of room to soak up the sun. For sports fans, you can find basketball courts and Mini-Golf courses on both the Dream and Oasis. The Oasis has an extra activity for the adventurous though: A zip-line. Yep! You read right, a zip-line. You’ll zoom right through the Oasis’s huge nine-story atrium hanging from nothing but a wire. I’m sure that would be the first thing I go to on the Oasis! The Oasis also has two rock climbing walls at the end of the Boardwalk section of the ship, another great thing for thrill seekers to do. Disney once again wins in another category: children’s entertainment. Almost an entire deck is devoted to children’s activities. Every kid, from toddlers to teens, will find something to do. The Oasis features kid activities, but they can’t compare to what Disney can do. Where else can kids meet their favorite Disney characters while at sea? It should be noted though that the Oasis of the Seas features a casino for adults that feel like that have a little luck on the high seas. You won’t find a casino anywhere on the Dream. Disney was the first in the Industry to break the norm of having one massive dining room. Instead, they rotate their guests through three different restaurants. It seems Royal Caribbean took note of what Disney did, and pushed it even further on the Oasis of the Seas. The Oasis of the Seas features a staggering 24 different dining options, while the Dream only offers about five or six ding options. Not all of the Oasis of the Seas dining options are complimentary, but the choice is abundant. The Dream features “Animator’s Palate,” a restaurant where Disney characters actually interact with diners, along with the ultra-luxurious “Remy,” which respectively costs an extra $75 per person. You’ll also find great bars and nightclubs for adults on either ship. Disney has made sure there’s more dining options for adults on the Dream compared with their other ships. Either way you go, you’re bound to fill your self silly with great food. Each ship features their own special amenities. On the Oasis of the Seas, you can walk through their huge Promenade, Park or Boardwalk. Each section features a selection of restaurants, bars and shops to browse through. At the Boardwalk, you can catch a ride on the carousel or watch divers at night plummet in the AquaTheater. 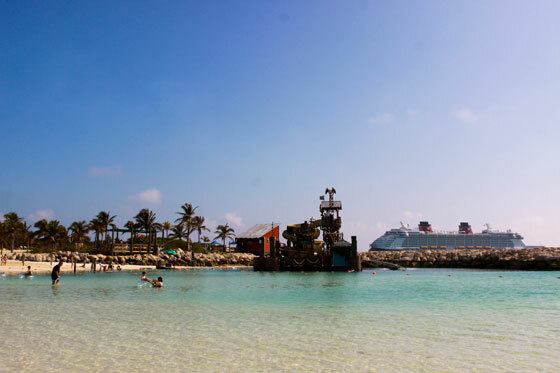 What might be the best perk ever on a cruise, all Disney Dream cruisers that set sail in the Caribbean are entitled to an entire day on Disney’s Exclusive island, Castaway Cay. You can get off the boat and finally soak up some true ocean waves with hardly any crowds. Almost all activities on Castaway Cay are included with your cruise, so you won’t be forking over more to get snorkels or such. There are also separate beaches for families and adults, just like the pools. Trams run around the island so you won’t have to walk everywhere. It’s a fantastic perk and might just be the thing that makes Disney the best out there. Enough with all the features, what’s this going to cost me? Well, it’s certainly not cheap to cruise on either ship. However, Disney offers flexible options for cruising on the Dream. We’ll look at the prices for 2 adults and 2 children with a standard Oceanview Stateroom. As you can see, both are fairly comprable in price. However, Disney offers 3, 4 or 5 nights versus Royal Caribbean’s solo choice, 7 nights. So from the big picture, Royal Caribbean looks more expensive, but in reality you’re spending just as much. In conclusion, both ships are the best in the world. They both offer outstanding accommodations, dining and entertainment. The Disney Dream is a true step up for Disney. They have created a luxurious ship that offers something for everyone. Disney truly has shown that it can create a ship not just for kids. From the exciting Aquaduck water slide, to the Broadway-style productions, the Dream is truly the grandest ship in Disney’s fleet. Combine the ship with a day’s stop at Disney’s very own Castaway Cay, and you have yourself an unforgettable cruise. While it may not have much style and class everywhere, the Oasis of the Seas is abundant in features. From its wide selection of restaurants, to its exciting features like the FlowRiders, zip-line and rock climbing walls, the Oasis sets itself apart from every other ship. The neighborhoods on the ship make the experience even more enjoyable with a unique attitude and feel for each. Either way you go, you’re bound to have a great cruise. Both ships are stunning pieces of modern building and you won’t be forgetting them anytime soon. What are your thoughts on these ships? Which one would you want to cruise on? Leave your thoughts below. Oasis of the seas is better been on both. Both ships look awesome, but its ‘dining’, not ‘dinning’! Thanks for pointing that out. I’ve went ahead and corrected it. I have not been on the Dream but I have gone for a spin on the Oasis, and well, it’s amazing! I’d be willing to argue that Royal Carib has placed the bar on a whole new level and then some. Even with the ship packed with over 6000 guests and crew, you never feel crowded, or have to wait very long for anything. And there is so much to do on the ship that the days at sea were just as fun and busy as the days on land. what did you prefer on the oasis that the dream did not have? also, how does their food quality differ? i was on the star of the seas last year and think the ship is amazing…with that being said…. we found it to be a bit limited for a 10 year old for activities and the poolside was always crowded could not find an umbrella and chair combo any day at 7am the entire week because people saved these chairs daily by 4am with towels and it was allowed? maybe this is how it is on every Easter week cruise…not sure? planning another cruise next year would like your feed back before planning. We’ve been planning to go on a cruise with my 4 yr old, and this article answers all my questions! Very helpful! Thank you. I still don’t know what to do, but I feel so much more informed. It may just come down to dates, now.